‘Kingdom of Ash’ by Sarah J. Maas is a bittersweet conclusion. Synopsis: Locked within an iron coffin by the Queen of the Fae, Aelin must draw upon her fiery will as she endures months of torture. With their Queen captured, Aedion and Lysandra remain the last line of defence to protect Terrasen from utter destruction. Yet they soon realise that the many allies they’ve gathered to battle Erawan’s hordes might not be enough to save them. Scattered across the continent and racing against time, Chaol, Manon, and Dorian are forced to forge their own paths to meet their fates. Hanging in the balance is any hope of salvation―and a better world. And across the sea, his companions unwavering beside him, Rowan hunts to find his captured wife and queen―before she is lost to him forever. This was always going to be a hard review to write and I’ll try to keep it spoiler free. Throne of Glass is one of the best series of books that I have ever had the pleasure of reading and I know I am not alone in thinking this. And with the final book now released into the world, I am devastated that this journey has come to an end. I knew that the books couldn’t go on forever but it was (and still very much is) a shock to find the last book in my possession. It’s unbelievable and too much for my brain to comprehend. 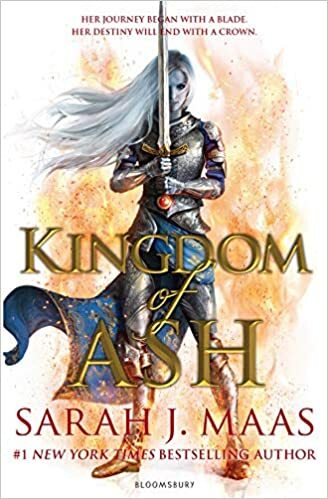 I am in denial and I feel almost lightheaded when I think of the scenes/events of Kingdom of Ash. Many of the characters are scattered across Erilea and even Wendlyn at the beginning and for the majority of the book, I couldn’t see how everyone would meet up again. I enjoyed every single POV and I loved reading about each characters path/journey. As always, I preferred Aelin’s chapters the most (yes, even those heartbreaking early ones) but Aedion/Lysandra’s chapters surprised me with how much I enjoyed reading them. I say ‘enjoyed’ but I was on the edge of my seat and nervous sweating. They took the brunt of the war and their hope went a long way to inspire others. Dorian and Manon are perhaps the characters that developed the most. We get to see Dorian explore the depth of his powers and his bravery. He also comes to terms with past events and his feelings toward a certain golden eyed witch. Speaking of Manon, she did what no one else could and through some questionable methods, she was able to bring a considerable force to aid Terrasen. Both of them have a lot to deal with at the end of this book and I would love to know what their future entails. Also, I have to talk about Fenrys, who is a hero. I can’t say much more than this without giving his story away but he deserves everything. I would love a story about him and his journey after the events of this book. War is heavily focused upon in this book – and of course there are deaths. There were two specific scenes that wrenched tears from me and all I can say is that they were noble deaths. If those characters had to die, then they couldn’t have gone out any better way. They were fitting to each character and though I was distraught to see them go, I’m just glad that none of my favourite characters met the same fate. It’s odd for me to think it, with so much war, there should have been more deaths but I’m really glad there wasn’t. The ending was so beautiful. And tear jerking. And now I’m crying again. I’ve run out of words because I’m so happy that everything Aelin worked towards, everything she had to endure, it was all worth it. Everyone she came across and helped over the course of this series (Nox, Falkan, Yrene…), they all came through in this book and it shows a connectivity and complexity like nothing I have read before. This is the book that shows the world that Maas is a queen. However, it has to be said, that many questions were left unanswered and I can only hope that these will be resolved in The World of Throne of Glass. I am in love with this series and like I said before, I am gutted – BUT this was the best book out of them all for me. It is the definition of strength and it is full of emotion, rich character development and an ending so fitting. I cried so many times and I will no doubt cry every time I read it. I honestly have no more words. It’s so bittersweet to know that this is the end. All I can hope for, is a spin off series to rival this one. P.S. I smiled so hard at the tiny ACOTAR cross-over and loved the way Maas shut that door.